Create a slideshow with music! Hi! 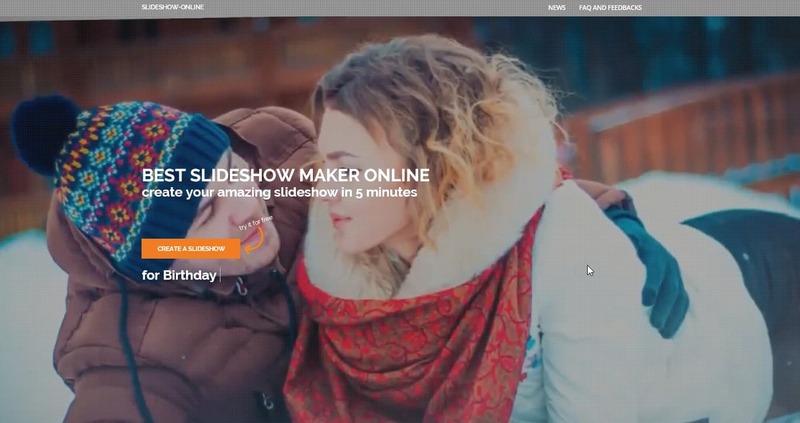 In this article I am going to tell, how to make a slideshow with music, what services and programs, free or paid ones, are for the purpose, and how to make a professional slideshow in just a few minutes. It is going to be interesting and not complicated. You have my word! Let`s start. Is it a significant reason to create a picture slideshow? How much time are you willing to spend on creating your video? How often do you plan to make a pic slideshow with music? By answering these questions, you will learn what slideshow maker is the best for you: an online one or the one through installing an application and studying of installation settings, a paid or a free one. Most often, online services require just selecting design, uploading photos (sometimes videos, if possible) and waiting for a finished slideshow. And here comes the fun part, ranging from the cost and ending with quality of graphics. Somewhere you will get a simple pasting with transitions without human intervention, somewhere your photos will be “packaged” into professional graphics, and a video designer will process your order. Prices are from zero to a few tens of dollars. Below, I will show samples of videos from different services. If the reason for your slideshow is not the most serious, and you do not notice much of a difference between these examples- choose the easiest and the most affordable service. You can get such after spending a few minutes to upload your files. Now, I am going to tell you about programs and software you can install on your computer. Before downloading a program, be sure to check with the tariffs. It will be vexing, if you spend much and effort to create your own video, and as a result, your slideshow will be with watermarks or logos that can be removed only for a fee. Note that Windows and Mac has free video editors with simple effects, such as “Move Maker”. Perhaps, built-in software will be enough for you. 99% of video editors for slideshows have roughly the same set of effects, transitions and templates. We should specially focus on Adobe After Effect, which is the most sophisticated and professional program for creating special effects in television and cinema making, it is difficult to master, but its slideshow will turn out much better. I will say it again: any downloaded software means study of settings and time spent on montage and editing. https://slideshow.photos/uk/ is an online service, a slideshow will be created in Adobe After Effect, but it will take you a few minutes just to upload photos. This site saves your time and money significantly. Let us summarize how to make a slideshow with pictures and music, and which program or website is the best able to cope with the task. There are great many services and programs, I will repeat myself again, you must first understand, why you create a slideshow, how often you will make them in the future, how significant its reason is, how much time and money you are willing to spend and how important the quality of the final video is for you. Correct answers will, on their own, push you to the choice of the best slideshow maker. If you have much time and are not afraid of difficulties with installation and studying of programs` settings, then download some soft (or use it free of charge). Bear in mind that such programs have very simple transitions and effects. If you want to create professional slideshows with modern video design, you have a few hundred dollars and a few weeks on training, then start to work with Adobe After Effect (a professional program used for creating movies, soap operas, etc.). If you want to spend as little as possible time and money, and get a slideshow with modern graphics and effect, look at the sample of videos above and select your online service. I vote for Slideshow Online. Good-bye!